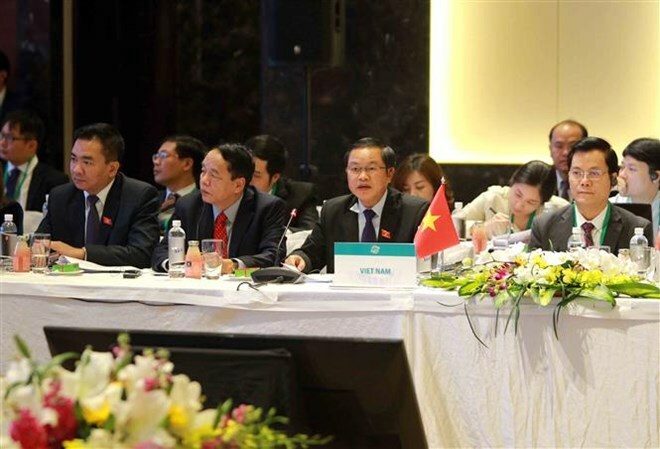 Hanoi (VNA) - Striving for peace, security, cooperation and development is a major, standard, and urgent task for all Asia-Pacific Parliamantary Forum (APPF) members, said Vice Chairman of Vietnam’s National Assembly Do Ba Ty on January 19. He made the remarks at the first plenary session on political and security matters of the 26th APPF meeting that is underway in Hanoi. On behalf of the Vietnamese delegation, the NA Vice Chairman proposed the APPF parliaments should play an active role in building a law-based environment of regional peace, security. As legislative bodies, they need to institutionalize international committments into their domestic laws, increase monitoring of implementation of responsibilities and committments to international conventions and laws, he stressed. The parliaments could also review, promulgate, and supplement relevant legal documents related to the promotion of mutual understanding and cooperation among countries on the basis of international law and UN principles, including respect for sovereignty, political independence, non-interference in the internal affairs of States, non-use of force or threat to use force, resolve international disputes by peaceful means, he said. He urged the parliaments to work to turn sustainable development into a long-term and prevailing orientation for development policies and measures. ‘The APPF can take the lead in strengthening a free, open, transparent, inclusive and rules-based multilateral system,’ Ty suggested. This year, Vietnam has prepared a draft resolution: “Promoting Parliamentary Diplomacy for peace, security and prosperity in the region and over the world” aimed at highlighting the role of parliaments in promoting observance of international law, supporting the peaceful resolution of disputes; urging greater cooperation, realising international commitments to respond to current common challenges; realise the priorities agreed to by member economies following APEC 2017 such as promoting inclusive, innovative, sustainable and equitable growth. Besides the promotion of parliamentary diplomacy for peace, security and prosperity in the region and the world, the APPF-26’s first plenary session also looked into the fight against international terrorism and trans-border crime. Participants pointed to risks posed by increasing trade protectionism and called on support and cooperation among the APPF members for trade liberalisation. Parliamentary diplomacy to end human rights violation and the settlement of the Korean Peninsula issue were also among the deliberated topics. Fahri Hamzah, Vice Speaker of Indonesia’s House of Representatives, noted that global challenges require deeper discussions at the parliamentary level, adding that Indonesia has included parliamentary diplomacy in law-making process as a measure to boost the activity. He said parliamentary diplomacy should play a greater role in addressing regional conflicts, particularly the Rohingya crisis. Masazumi Gotoda, member of Japan’s House of Representatives, stressed the importance of dialogue particularly in the settlement of issues on the Korean peninsula. Konstantin Kosachev, member of Russia’s parliament and Head of the Committee on Foreign Affairs, called for joint actions against the proliferation of chemical and mass-destruction weapon.